From reading several quilting blogs, I get the impression that lots of quilters are using EQ to help them design quilts. I must admit, it looks like a fabulous tool and a part of me really wants to get my hands on that software – but I can’t justify the expense right now. 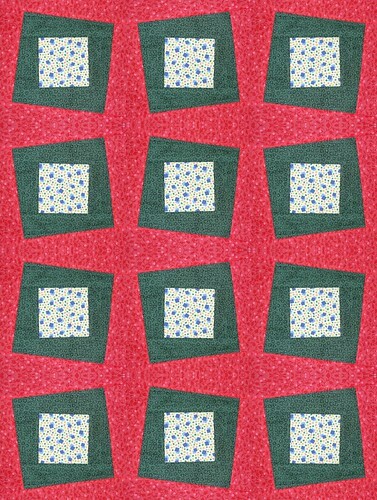 My quilts are all designed with graph paper and colored pencils. I know. I’m very technologically advanced. This is not quite what the finished quilt is going to look like. I’m playing around with the widths of the strips I use and that is just some leftover fabric I found lying around. This is definitely not the color scheme I am going for! nice work. I’ve got a friend who designs quilts in excel (she’s a simply-square kind of gal). What I love about EQ5 is the ease at which you can change the colors of your blocks– 2 clicks and all of the blue patches are now teal, 3 clicks and every other block is a fan instead of an Ohio Star. Ctrl+Z and it goes back to the way you had it. OMG, i love EQ5. Of course I never would have bought it if I didn’t have tons of store credit at the quilt shop where I was teaching classes, but… if you can get your hands on a copy, give it a try.. I like EQ5 too. It’s a great tool for taking traditional blocks and resetting them into your own designs. I used it to create my templates for the Halloween quilt I’m working on. It has a very good drawing tool (just like graph paper only on your computer screen). After you have your design drawn you can print out the templates for paper piecing or traditional piecing, re-size (for example I decided to change my Halloween block from 10 inches to 9 inches without having to re-draw it), drop the block into a quilt design, color it, on and on.